It’s the unpredictability that makes the event, but is also the unpredictability that makes the knowledge itself. Not what can be probabilistically determined but the unprobabilistic point that rips the veil of knowledge and shows something that until then we were unable to predict. The unquiet Mr. Palomar is standing by the sea but he doesn’t observe it, instead he fixes his eye in a wave, just one. His attempt is to predict all its movements, its random dynamic. He seeks to find an order, a scheme, a mental image, which could allow him to organize all that complexity. He doesn't give up. He reduces the observation field and lists all the slightest details and variations. If accomplished, soon he will be able to predict all those movements and proceed to that ultimate stage: extend this knowledge to the whole universe. But the tide changes suddenly and Mr. Palomar ends up to lose his patience, returning home even more nervous and unquiet than before. This small metaphor that Italo Calvino offers us about the human models of world comprehension is here as simple as splendidly exposed. In fact, man builds himself upon his desire to control the world phenomena, to name and give them a sense, a meaning. To project, to investigate, to plan, are the names of those apparatus that seek to control reality. Forms, operations of the everyday life, that trace a path to a specific human artificiality, where man safely dwells before the constant menace of this endless exterior, that we call the arbitrary, the unpredictable, the uncertain, or just, the becoming. The house-shelter is not the indomitable territory-wave, but the small observation field of the protected and predictable things. The house is build under the sign of firmitas, of durability, of a habitus able to put us safely in the world. But the question is the appearance that is made to appear. Each observation field is just a temporary station, a passage, and just like in Palomar, there is always a tide, an imminent and unpredictable disturb. All construction is provisional, contingent, that is our human essence, in death beyond death. What is irreducibly interesting in the Mallarmé poem Un Coupe de dés, is that chance is a metaphor that names not the poem object, but its irreparable purpose. If there is someone that precedes Duchamp in the search of a maximum amplitude and indetermination in the meaning of the work of art is precisely Mallarmé. The chance that the French poet assigns is the unpredictable openness which is unlocked in the poem own interpretation. The white space that is left between the phrases is the space of chance, of interpretation, of the meanings that each reader (op)poses. This was as well the meaning of the duchampian word infra mince, that untraceable detail, that minimal event able of giving a provisional meaning to the work of art and transform it not in an aesthetical object but in a provisional content, an agency of other meanings. And this is was as well John Cage’s absolute quest, not the search for a new language, but that of opening the music to the unspeakable world of chance, but opening as a way of breaking the traditional codes beyond the endless deadlock of all academic mimetologies. That was also the last search of Yago Conde, this precise indetermination of the architecture meaning. But an indetermination that is not the infinite search of randomness, but architecture own precariousness. Precariousness as provisionality against the automatization of the self closed discourses; precariousness as experimentation, questioning, in each moment, architecture itself and the excessively precise meanings that we forget already to interrogate. In short: precariousness as a way to be aware, against the excessively comfort of the habits. As writes Pep Quetglas in his foreword to Yago Conde’s Architecture of Indeterminacy: «Thus, two apparently distinct and complementary forms – ‘planning’ and ‘automatic’ – are nothing but names for a single, unique and destructive enterprise: that of depriving people of their activity and their present – to deprive us of our lives – and to convert us into mirrors and spectators of that which does not exist, that which moves without us for and by itself, to make us into heralds of the future, that’s to say, of nothing». The uncertain as the unpredictable and indetermination as the provisional are the meanings of the word chance that interests us to emphasize, nonetheless they are also the meanings that arise from the etymological origin of this word. Casus (the Latin word for chance) meant not only an occurrence, an opportunity, but named also the very act of falling (cadentia), of what unpredictably falls, happens, and therefore perishes. What becomes relevant in our digression through this word is that what we call today casa (house in Portuguese, Spanish and Italian) has precisely the same etymological origin as the word chance (acaso) . To the Romans the word casa didn't mean something solid or steady, but a temporary and precarious construction, a hut, a shed. That was this word and not the word domus (the lord domains) to name this distinguished and unique place of the human dwell and privacy against the exteriority reveals much about the precariousness of the name and action that the word casa (house) still today designates. If, in one hand, the domus invokes at once this triumphant action over the territory and over the nature, in other hand, the name casa brings within itself, and clearly, this precariousness and fragility not only of its construction, but of the very act/event of making oneself to dwell and to occupy a place for practicing this reside, this being-in-the world. If, as Heidegger says, to move toward the words is to move toward the world, and if theory and the exercise of writing are, most of all, a tool box, as Foucault wrote, so the question that come to us should be, what can we make with those names and what can they identify and offer to our daily activity? In this case, the words remind us that even behind the appearance and stability of the name casa, it is something profoundly precarious and provisional, but simultaneously something that is made upon this provisionality. The house-project, as something absolutely predefined and finished, should be replaced as house-tactic, as something thought and designed recognizing space and time provisional nature. If chance has any meaning as an experience of the world is the awareness of a specific dimension of life and dwelling that appears always unprobabilistically, asking always for attention, answers, but mostly for invention – the ability to listen the unpredictable and to rehearse a (re)action. Because it’s precisely there, in this abrupt space of confrontation that occurs out of the habitus routine, where is produced the being creative essence in the world, where he produces/finds its own space of action and freedom. And when this happens, when this unpredictable and indeterminate space opens up, we can say that man makes himself a home (casa), or maybe, he makes himself at home. What the word casus names is precisely this, that possibility for something to happen, and this incalculable happening that the house allows and offers is the place of the self, of the being along-the-things; never over-the-world (as in the domus), but always provisionally, indeterminate, always opening us into a new and free relation with things. The house is not just a structure for a distracted everyday event, but the practicability that allows the self a place in the world, not for him to hide from it, but to communicate with the world. That this space cannot be predefined in its form, nor predictable in its meaning, isn’t an imperfection of the house, but its gift, the ultimate possibility that allows architecture itself, leaving always something to (be)come, to (be)fall, and to take place in the world, beyond the world. In the techno imposing landscape of reality any architectural discourse on the house will have to recognize that it’s mostly an open process, a provisional tactic for a conquest of a place. And, that the last stronghold of the human dwell shouldn’t, and can’t be, a submission to the bureaucratic dictates of laws, markets or images, but always a meditation-excursion in the world individual freedom construction, as much as the creation of a relation space towards the other. This is the meaning of the word agio (at ease), convoked by Giorgio Agamben, that «designates, according to its etymology, the space adjacent (ad-jacens, adjacentia), the empty place where each can move freely, in a semantic constellation - where spatial proximity borders on opportune time (ad-agio, moving at ease) and convenience borders on the correct relation». Agio is the place of the free use of the proper, is the space to come, of what is neither determined nor destined, and only to us is left to be accomplished and achieved. Agamben call it ethos, our ethic possibility, our second nature, but also the unique and possible place of our singularity. Agio is the space of our self that is left in suspension, a space-casus and a space-casa, that remains to make and to (be)come. Is not a random place, but the adjacent space, indeterminate in its margins and unpredictable in its nature, which opens up in the limit of the being and allows him to conquer its singularity, his proper place in the world. To have agio is to make (himself a) house, it’s to conquer the world intimate fragility, but it’s moreover, the place-encounter that is made in the presence and search towards the other, in the semantic constellation and in the provisional and unique simultaneity between two times and two spaces. It's a verb more than a name, an action more than a fact, an open and indeterminate space that makes itself world between man and things. But isn’t the agio also this indetermination in the objects limit that Yago Conde was searching, the white spaces between the Mallarmé’s phrases, the unsounded silence in John Cage’s music or the duchampian infra mince? This untraceable and unpredictable moment that makes the encounter between the work of art and the spectator a fully individual and inter-subjective event, beyond any universal meaning. The work of art opens up to chance, to the interpretation adventure, and it’s the interpreter-creator that gives its ultimate meaning, possessing it, destroying it, remaking it. And when this unique instant is to make casus and casa, happens precisely what we can call the aesthetical momentum. Baudelaire wrote that is the immediate passage from experience to memory that makes precisely the aesthetical momentum – what he called the memory of the present. But isn’t this momentum also that unique instant where the experience is simultaneously already the memory, i.e., where the present is already the absent, where what I see is simultaneously what I remember? The absolute and unpredictable synchronization of two times, the untraceable paradox that allows something to escape darkness and be, at last beauty – not by its form or proportion, but for setting us face to face to this human impossibility: to remember what I still can touch and to touch that which I know I will remember, I want to remember. That this unexpected momentum, this slightest instant, can occur and take place, disturbing the limits of our language and interrogating our everyday life, opening a space – an agio – of closeness and encounter towards the world, is this the ultimate meaning and aim of the architectonic work. That this can occur unpredictably, indeterminately, and even on the most untraceable and slightest detail, only reinforces our confidence in the architecture ability and worth. All artistic production requires from us attention and wake; there is always something to un-veil, to dis-cover. But the revelation truly content isn’t what in itself is to be revealed, but what in its silence is still left to be said. In other words, not what in itself is inexpugnable, but what is left to me to be said. The same is to happen in the architecture work: if nothing has been left to be said, and to (be)come, so it means, that nothing was in fact said. As Agamben writes, «the only content of revelation is what is closed in itself, what is veiled - the light is just darkness arriving in itself». It is as it would always be necessary some sort of interlude, a space left, but not exactly a void or a silence, rather a threshold that one can be able to conquer and disclose, reclaiming as yours, intimately yours. As the impending closeness of a revelation that never comes to be said. In the excursion-in-voyage over Álvaro Siza’s architectonic spaces there is always something that remains to be said, there is always an indeterminate meaning, an unpredictable gesture asking for another meaning. Siza’s fundamental lesson isn’t in the drawing or in the method, in what we immediately can see, but in what remains to be seen. For Siza, architecture is mostly a critical and ironic apparatus on the exercise of the everyday life. Each building is in itself a meditation on its condition; each building subverts its own essence and interrogates the nature of our relation with space, with the programs, with everyday life. In the distracted landscape of our daily routine, Siza makes of the architectonic space an experience to (be)come, interrogating and provoking us, subverting the most slightest detail and requiring from us all concentration and will, but mostly, all the ease – agio. The black trace around the Carlos Ramos Pavilion; the stairs-path accessing the Boa Nova Tea House; the red-colored cube walls in the entrance of the Architecture Faculty of Porto, but also the accelerated perspective in its main corridor, and in Berlin, the Bonjour Tristesse imperceptible eye; they all keep this precise indetermination of architecture, that ability to provoke the imponderable, to interrogate, of opening a space in the memory of the present, ripping the veil of knowledge and bringing always something new, impossible and beauty. The Provencal poets (whose songs first introduce the term into Romance languages in the form aizi, aizimen) make ease [agio] a terminus technicus in their poetics, designating the very place of love. Or better, it designates not so much the place of love, but rather love as the experience of taking-place in a whatever singularity. Nine memories-notes (Le Corbusier, Villa Savoye, Álvaro Siza, Faup e Bonjour Tristesse, Mies, Pavilhão de Barcelona e Neue Nationalgalerie, Steven Holl, Kiasma. Stéphane Mallarmé, A roll of the dice will never abolish chance, 1897. «In coup de dés Mallarmé inaugurates a poetic form which contains a plurality of readings – something altogether distinct from ambiguity or plurality of meanings». Yago Conde, The architecture of the indeterminacy, pp.63. Mallarmé had a decisively influence in Duchamp, as it writes Octávio Paz, «The direct antecedent of Duchamp is not to be found in painting but in poetry: Mallarmé». Yago Conde, pp.64. Mimetology is a Jacques Derrida term, where he «expresses his opposition, not to mimesis per se, but to a determinate interpretation of mimesis». Yago Conde, pp.67. 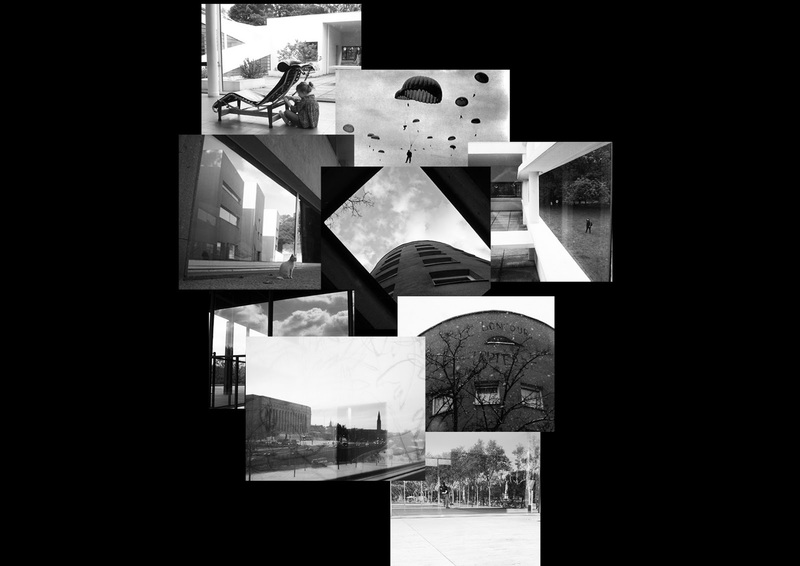 Yago Conde, The architecture of the indeterminacy. According to the etymological dictionaries and to San Isidoro de Sevilla (Etymologies), the origin of the word chance (acaso in Portuguese) is in the Latin casus (chance, opportunity, accident) that is etymological linked to the verb cadere, that means, to fall, to decline, to perish. The origin of the word chance has different roots in the European languages. If in Portuguese acaso is directly linked to the Latin casus as in the English and Italian. In Spanish, azar, takes the Arabic form, az zahr, that means literally the dice, evoking the traditional Arabian game. In French, hasard, has exactly the same origin. In German, the word zufall, also expresses the idea of something that falls. This essay, originally written and thought in Portuguese, follows the root of the name casa into the Latin casus, cadere, uncovering a relation between casa e acaso. In roman times, the word casa identified the roman army tents and expressed a temporary and fragile construction. The English word house is linked to another etymological origin: hiding, concealing (huis). The fact that the word casa has no place in the English language, also shows something about the different cultural relations between man and his dwelling. In the same way, the French maison also takes another root, linked, to the Latin mansionem, that is, a staying, a remaining. Domus is the Latin word that named the lord’s house and domains (dominium). For Heidegger, understanding/ thinking the names behind the words is to understand/think the immemorial relation between man and world. CF. Heidegger, Das ding. Giorgio Agamben, The Coming Community, pp. 24. The expression feeling at home, expresses that decisive verbal form that makes the concretization of the home/house and amplifies its provisional meaning as something that takes place, happens, through the momentary production of a space to be in, an agio. A home is not a house. The building itself doesn’t make necessarily an architectonic experience. Charles Baudelaire, Critique d’art suivi de critique musicale. The memory of the present reveals, in Baudelaire, the ephemeral meaning of the present, but retains also the importance of the present experience as construction of a singular memory, an ability to be present in the present, to be aware of the world instant dérive. As it writes Baudelaire: the one that «…perd la mémoire du présent; il abdique la valeur et les privilèges fournis par la circonstance, car presque toute notre originalité vient de l’estampille que le temps imprime à nos sensations». Giorgio Agamben, The idea of prose. pp. 117.